Recommendation of the Day | Small, but valuable. I’ve been struggling through some books for various assignments and commitments lately and just haven’t felt inspired by reading. It happens sometimes. As a good librarian, I feel obligated to work against that, however. While updating a list of recommended books at work this morning, I ran into one of my all-time favorite authors, P. G. Wodehouse. Thank goodness, a cure for what ails me! One of the good things about Wodehouse is that he was pretty prolific, so you could read a few of his books a year for the next twenty years without rereading a thing. But that’s only good news if he’s really a fantastic author. Oh, don’t worry. He’s that good. Lots of Wodehouse’s characters are entertaining, but the Jeeves stories are the most popular, and for good reason. Jeeves is the basis for everything you imagine about a perfect valet. He’s a genius with a knack for getting his gentleman out of trouble without breaking a sweat. Bertie Wooster is the gentleman in question, and he gets into plenty of trouble. His problems include things like hiding from policemen he stole caps from at some point in the past, getting his hands on a famous cow creamer that’s guarded by a grumpy British Lord, and sneaking bratty kids back into boarding school. You know, the normal things you deal with every day. I highly recommend spending this moment to think happy thoughts about your own experiences reading about Bertie and Jeeves or to take a quick jaunt over to Amazon to pick up the book that tells you how it all began. No other options are really advisable (unless you want to borrow a copy of a Wodehouse book from me). If you’re interested but don’t love reading, there’s also a tv series based on the books. It’s called Jeeves and Wooster, and it was my introduction to Wodehouse. 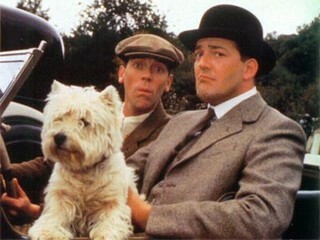 Hugh Laurie is Bertie, and Stephen Fry is Jeeves. It doesn’t get much better than that.